The Part of Sales That is Better Than … Well, Almost Anything! Today we are going to wrap up our exploration of learning from the true greats. This one has a special place in my heart. 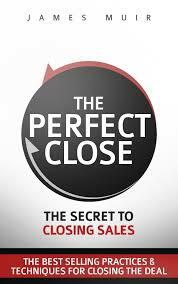 In one of my favorite sales gigs, I somehow got nicknamed – “The Closer”! It was my absolute favorite part of the sales process and it still thrills me to take a deal across the finish line. Like it’s better than almost anything else I know. Now, I don’t know about you – or how much you’ve read about closing. There’s tons out there and, frankly, I’m NOT a fan. There is the assumptive close, the trial close, the sharp angle close, the Ben Franklin, The Porcupine… SERIOUSLY? I have no idea what these horrible techniques are or where they came from. I truly cringe when I come across them (I found these ones on Google). Most closes you will learn have nothing to do with creating a great customer experience. They are more about getting the deal done no matter what. Not true with James Muir. I can attest that this guy is the real deal and brings MORE than a dash of dignity to the art of selling! Want to be a true pro and create a great reputation for yourself with your clients? Want to get the deal done in the most professional and effective manner? The truth is – you can have the best sales processes and the best prospecting techniques, but if you can’t close the deal – you’ve got nothin’! Do not pass go, do not collect $200, go directly to Amazon and pick up this book for you and another for someone you care about. Love CLOSING your deals UP!